Stocks drop - are we in a trading range or in free fall? We have seen over the last couple of months that all news, good or bad, was mostly taken in stride. This week, it was a different story. Things this past week didn't seem any worse than they had been in previous weeks. Economic reports were not particularly bad though the PPI report heightened concern that inflation is creeping though the supply chain. There was a drop in existing home sales, but then we already knew that housing was in trouble. Financials are still in trouble as evidenced by problems reported at Moody's, UBS and AIG but that shouldn't be a surprise either. Airlines and auto makers also contributed to the negative tone but why that was a new factor I don't know. What really stopped the market in its tracks was the combination of oil and the Fed. Oil turned in another strong performance this week, closing over $131 per barrel. The Fed released minutes of their last meeting and language was quite negative. The Fed implied that further rate cuts were unlikely as the risk of inflation appeared to be equal to the risk to growth. And speaking of growth, the Fed also revised their estimates of GDP downward while increasing their estimates for unemployment and inflation. Some of this was telegraphed by the statement at the time of the last FOMC meeting but the language of the minutes provided insight that served to frighten investors out of stocks. All told we have seen a real shift in sentiment. Much of what hurt this week's market was not particularly new. Indeed, the news could be categorized as more of the same. Yet this time the market sold off. As can be seen, we plot six different indicators. After this past week's market action we now have many of them moving in a direction that indicates weakness in the market. The picture here is not pretty. The number of stocks trading above their 20-day moving average has taken a huge tumble, falling from over 4800 down to 3350, a drop of 1450. In percentage terms, we used to have 66% of stocks above their 20-day MA and now we have 46%. The 50-day moving average reacts more slowly than the 20-day moving average but here too the damage was surprisingly severe. Last week we had over 4670 stocks trading above their 50-day moving average, this week the count is down to 3900. One of the most solid indicators we have been tracking is the number of stocks whose 20-day moving average is above their 50-day moving average. This indicator has been marching steadily upward since March. This week it actually declined slightly. We can expect to see further deterioration in this indicator now that so many stocks are trading below their 20-day and 50-day moving averages. This week we see more consistent signals from Aroon and Chaikin Money Flow analysis. The Aroon analysis we do shows stocks in strong up-trends or down-trends. The chart shows the number of stocks found to be in strong up-trends has dropped by a modest 240. The number of stocks determined to be in a strong down-trend has increased by about 220. 1420 stocks, or roughly 20%, are now in a strong downtrend. We also plot the results of Chaikin Money Flow analysis. The number of stocks undergoing strong accumulation or buying has decreased from about 1100 last week to only 695 this week. Not shown on the chart is the number of stocks shown to be undergoing strong distribution or selling. This indicator increased last week, with the number of stocks in this category going from 440 up to 600. 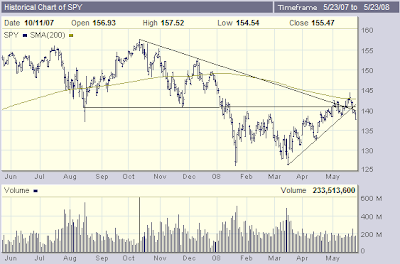 As we usually do, we will use the SPDR S&P 500 ETF (SPY) as a proxy for the market in general. In the chart below we see that SPY sold off strongly this week and failed at several technical levels. The list of technical tests that failed is long: SPY failed to stay above the 200-day moving average, it dropped below support in the $140 range, it failed to stay above the downward trend line whose high point was established last October and it dropped below the upward trend line whose low point was established in March. Other technical indicators are equally weak: DMI is somewhat bearish, MACD has turned down and SPY is below its 20-day moving average. That said, there is technical hope. SPY is sitting right at its lower Bollinger band and is still a bit above its 50-day moving average. According to RSI, it is no longer over-bought and Aroon analysis shows that SPY is still in a general up-trend. The sentiment, fundamentals and technical indicators all argue for further consolidation. I don't believe stocks are in free fall; for now, the operative word is consolidation. Moving averages show stocks have broken down but will they drop further? Three weeks ago stocks advanced to a point where I didn't think they could keep up the pace of the rally. The post I wrote at the time predicted a trading range. There was a pullback and then a move higher. Now, here we are three weeks later with roughly a 5% pullback from the high. I suspect we could see stocks give up another few percent before the bottom of the range becomes clear. Fundamentals in a number of industries were not great to begin with even as stocks rose. Some of those industries such as financials, homebuilding, autos and airlines continue their tough times. Other industries like technology and those involved in commodities continue to at least muddle along and provide support to the market. Negative sentiment prevailed this past week. Positive sentiment could return and drive the market higher again but only if this week's economic reports cooperate. We have a full slate of reports coming up and if the majority turn out to be passable to decent, stocks should hold the bottom of their range and perhaps move up a bit. As a result we will have to keep an eye on the economic calendar and be ready to duck. We will be seeing consumer confidence, new home sales, durable goods orders, preliminary GDP, initial unemployment claims, crude inventories, personal income and personal spending and Chicago PMI. This should give us a pretty complete read on the state of the economy. It should be an interesting and possibly very exciting week. And let's hope oil doesn't set any more records again this week.